From a very young age I have had not severe but not mild either anxiety. My way of dealing with it was always to bite my nails (Yes I am well aware that it is a horrible habit). My Mum and Dad always used to make me sit on my hands or had to keep moving them away from my mouth. This hasn't gone away as I've got older. In fact it has got a lot worse. But recently I have stopped myself from biting them and they are now a very decent length which I am quite pleased about. This means that I am now able to wear more nail polish and keep my nails looking tidy and healthy. Because of this I thought I would do a nail polish collection for you all to read. Unfortunately I didn't have the time to sit and swatch them all on my nails for you all to see so what they look like on but I thought I would introduce you all to the basics and show you what the colors are. I've heard a lot recently about Sally Hansen and one of my friends Gabriella (click here for her youtube) has been raving a lot about the polishes recently as well. I spotted this daily nail treatment in Superdrug (yes it is like my second home) and I just absolutely love it. You basically use it like a normal nail polish but unlike nail polishes it actually strengthens and increases the growth of the nails too. I've seen such a difference. The cuticle oil I blame Miss Glamorozzi (Ingrid) (click here for her youtube) for. I saw her rave about this in one of her videos and I've been after it for quite a long time but I never saw it when I was out. I ordered it online and it hasn't disappointed. You basically use it in your cuticle area and massage it in and around your nails to make them more healthy. The bonus about this product is that it doesn't actually smell like nail polish normally does but it has a apricot smell to it and its really strong and fruity. Definitely check this product out if you haven't already. Now the majority of my collection comes from Barry M. About 2 months ago I walked into Superdrug and saw that they have a 'Gelly Shine' range. I absolutely love these and in my opinion they are better than the original. This is because I think that have a nicer finish. By this I mean that they are a lot more shiny than the other polishes. I don't normally like dark colors purely because my nails are quite short and I just think dark nails makes them even shorter. Because I used to bite my nails I also found that it draws a lot more attention to them and I don't know about you but I don't want to get evil glares because of my nails! It has happened! 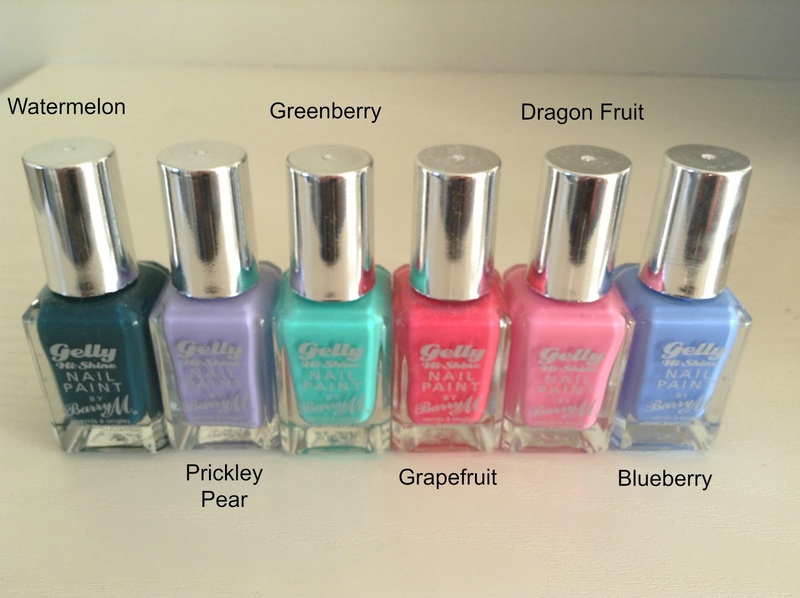 Greenberry and Dragon Fruit are my favorite colors especially for this time of year as they just look so good on the nails and are perfect for the bright summery weather we are having at the moment. I found the 'Superdrug Xmas' nail polish in December and it has been one of my favorite polishes to use for nights out. I love the icy blue lid as it turns a lot easier than some of the other nail polish lids. I love the greeny blue color that comes out on your nails once applied. I find one coat is enough but two coats definitely give the nail polish a stronger finish. The Barry M Berry polish is a very pretty lilac color which again is perfect for this year. This nail polish isn't as shiny as the Gelly colors which I don't like to much but still provides a very pretty finish on the nails. 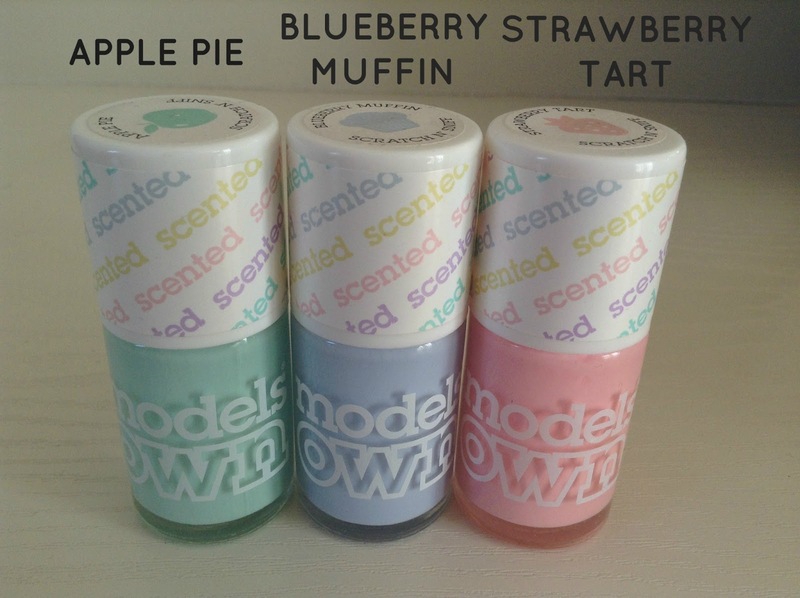 I've never owned a 'Models Own' nail polish in my life and then one day my friend Gabriella sent me a picture of the scented collection. These 3 colors are once again perfect for spring and summer time and a bonus is that once they are dry they each have their own scents to it. Not going to lie I do find this kind of pointless because am I really going to sit there all day sniffing my nails? The answer is obviously no but if you need to blow your noise or something then these are indeed pleasing to the nose. It is definitely a lot better than the standard smell of nail polish anyway. 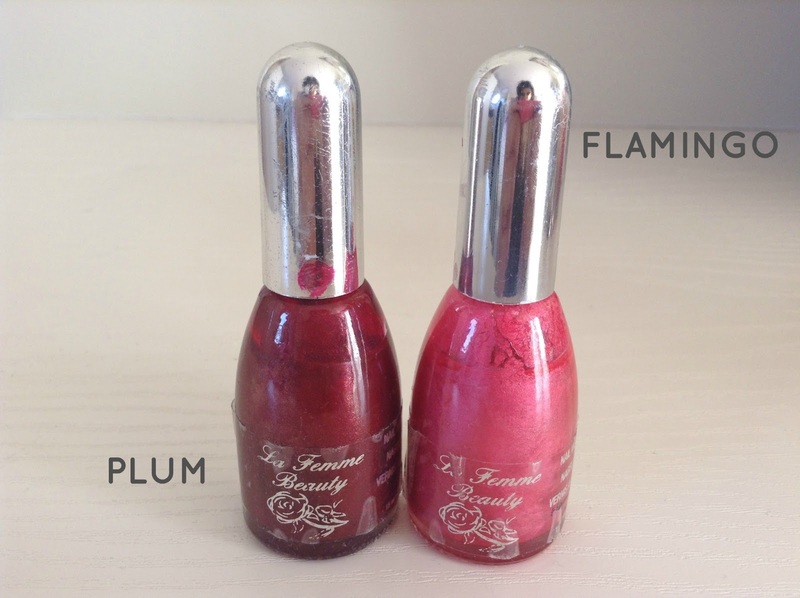 The next couple of nail polishes I have are from a brand called 'La Femme Beauty'. I actually found these on a stall in my local shopping mall/centre. As much as I love both of the colours I really do not like the finishes. I find that they are to matte and not shiny at all. I also hate the fact that within a day they are already half chipped. Very disappointing as the colors are so gorgeous on the nails, especially the Plum color. I find the plum color suits my skin tone a lot more as well. I find it is very hard to find a nail polish that compliments my skin tone but this one does. It's just a shame that it chips pretty badly. These two nail polishes are literally two of my favorite nail polishes I own. I bought these two polishes for my cousin's wedding just over a year ago now. I love the clear/top coat like nail polish as it is just amazing for adding a bit of shine to matte finish nail polishes and it also doesn't chip to easily either which for me is a bonus as I am quite lazy when it comes to my nails and hate reapplying the nail polish. If it chips I tend to remove the nail polish straight away. The pink color is absolutely gorgeous. It's a bright barbie pink has got little traces of silver glitter within the formula adding just a little bit more sparkle to it. Absolutely love wearing it in the summertime. Probably one of the most talked about nail polish colors in the last 3 or 4 months. I first spotted this brand in The Oxford Street branch of Topshop where they literally have every single color in the Topshop range! One of the best things about this nail polish is the size of the bottle. Unlike with my other nail polishes I find that it is quite easy to use up the full bottle. It's not too small so you use it within a few days and its not too big that you'll forget about it and leave it. It doesn't go all gooey like other nail polishes do. I find the color is more turquoise than actually green and since that is my favorite color I did not hesitate to buy it. 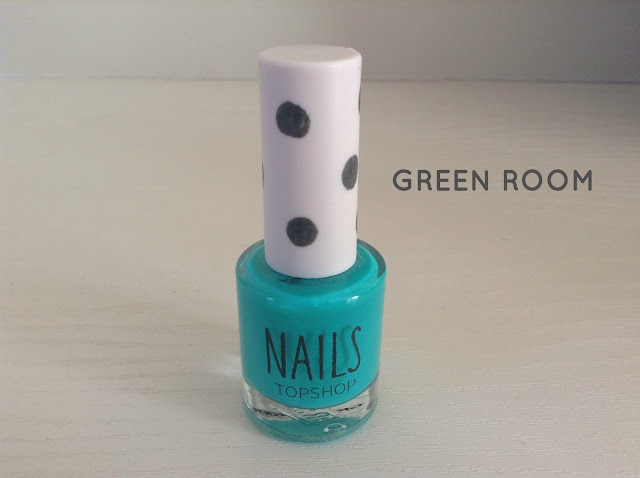 It is quite pricey (£5 I think for one bottle) which is why I only have one color in the Topshop range but if I have a little more cash on me I won't hesitate to purchase a couple more colors as they are a really good nail polish. 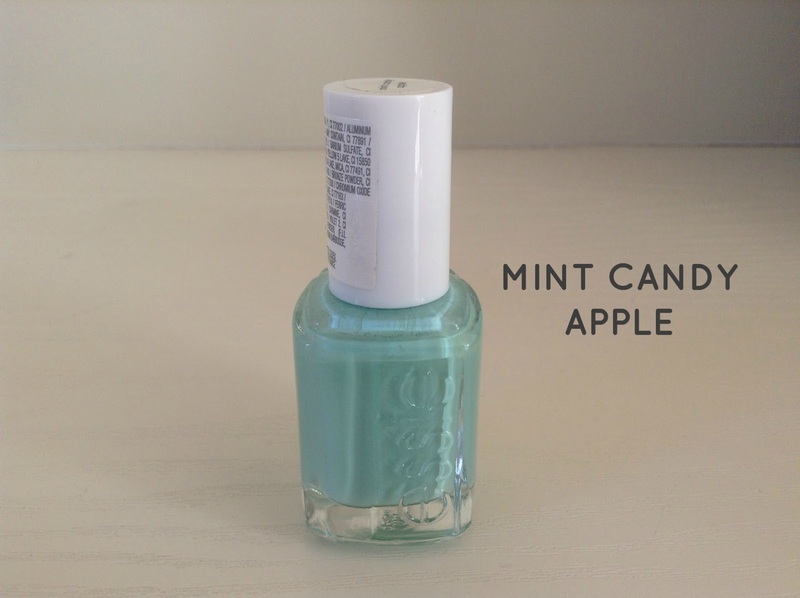 Another most talked about nail polish color in the beauty world is Essie's Mint Candy Apple. It is a very pale pastel green which I absolutely love. It is a really fresh color and definitely one for the spring and summer times of the year too. One thing I love about this color is that it is actually mint green. A lot of the other mint green nail polishes I find are a little too light to be considered mint green and therefore are way to light for my skin tone. I find this compliments my skin perfectly and looks incredibly pretty on the nails. 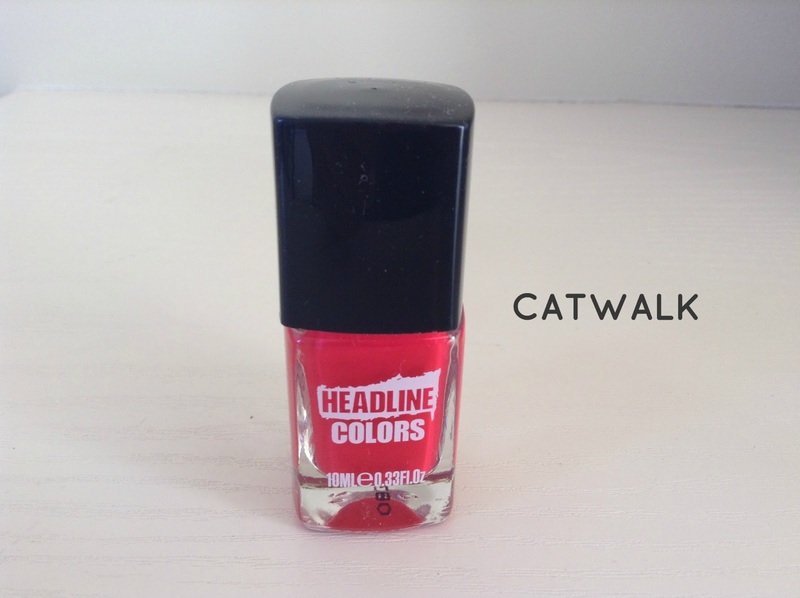 2 coats of this nail polish is enough to highlight the nails and do the job! As much as I like this nail polish I do find it a little bit overpriced. I don't think I'll be purchasing another Essie Nail Polish. I got sent this product in the May 'Glossy Box' (which by the way are huge disappointments and I would recommend them) and these was the only decent product inside it. I do find that the color is very strong on the nails. However, it leaves an absolutely gorgeous finish. I find this is a perfect color for summer time but can also be used for brightening up an outfit in wintertime too. One thing I absolutely love about this nail polish is that one coat is enough to do the job and cover the nails. It is pretty difficult to tell when the nail polish has dried though as it has that almost-wet look finish to it. As someone who loves shiny nails this is a bonus for me! As good as the nail polish is it is priced at around £9.00 which I personally find a little too much for a nail product. I remember getting this nail polish as a free gift with Glamour magazine and I absolutely love the color. It is a very pale pastel pink. The color in the bottle, in my opinion is a misjudge of what you can expect on the nails. I find that when you apply it, it is a lot lighter than you might think. This was actually a disappointment for me as I find warmer toned colors tend to compliment my nails better. I also find that it needs between 2-3 coats in order to get the color right on the nails. This product is meant to be around £10.50 and I definitely will not be paying for this brand as I do not think it is at all worth it. I absolutely love this color. I find it is a dark turquoise color and just looks stunning on the nails. I find that only one coat of this nail polish is enough to work it's magic. My favorite thing about this nail polish is that it doesn't take to long to dry and I find the color lasts quite a long time as well. Definitely will be investing in more colors from this brand. This is probably one of the cheapest nail polishes I own. 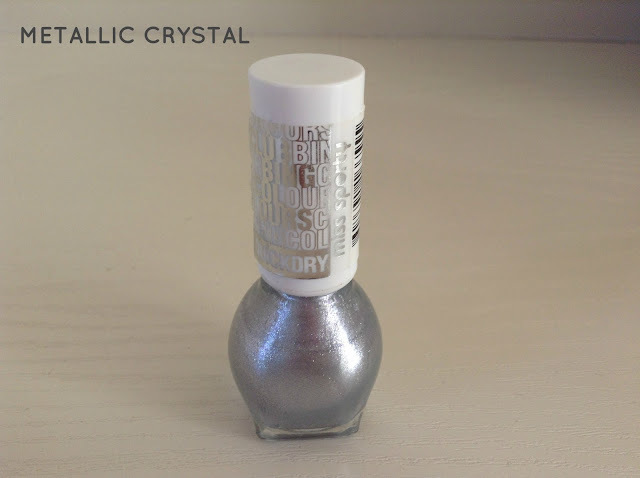 Priced at just £1.99 it is a gorgeous shimmery silver color that just looks perfect on nights out. This nail polish dries fast, doesn't chip to easily and I find looks gorgeous with any skin tone. I do however, find the bottle quite small and I do think that you can use all of this product up quite quickly. Do you use any of these brands? If so which is your favorite brand? Can you recommend me any other colors from these brands or other brands? I'm really hoping to give that cuticle oil I try- I've heard such great things! Love your collection of nail polishes -such pretty colours. Everyone thinks I bite my nails, but I don't. I get anemic quite often, so my nails get brittle and break, therefore looking like I've bitten them. I really need to invest in a hardener at some point. Loving your polish collection!! The Models Own pastel colors are so pretty!! So many fabulous colours. Love Barry M, Top Shop, Essie, Nails Inc and Models Own. they are such amazing brands aren't they? Best brands for nail polish by far they have such perfect colors and the formula in each of them is just so good!